Another hour, another phone gets the leaked Gingerbread treatment. If you remember correctly, not too long ago some T-mobile G2 warranty replacement devices were being delivered with Gingerbread. Now, that same build can be downloaded to your very own G2. Sure, it has it’s share of bugs (they all do), and there will be an official update later, but this will surely pass the time. Hit the source link for the download and let us know how it works. been using it for a week and it works fine. wifi goes out sometimes. It sounds buggy, so I will wait for the official version. I guess the bugs are why it hasn’t been released OTA yet. It’s about time. HTC is very slow when it comes to updates. With a stock android, it shouldn’t take this long. exactly thats what im saying. it works great for me so im guessing they will release it by the end of the month. They have to wait to update the Amazon MP3, Facebook, Photobucket, QuickOffice, Twitter, and web2go apps, IMO. I really wish they would’ve excluded those apps and let us download them ourselves if we want them. I know I could root my device and delete these apps (the thought has crossed my mind a few times), but I don’t want to void my warranty. The WiFi calling & Swype are good. They can stay. and the strange thing is the G2 doesn’t run Sense, what could’ve possibly taken them so long? Something fishy going on? First the G2x gets the long overdue update and now the even longer overdue update for the G2…Is it the manufacturers or maybe T-Mobile that is dragging its feet. has to be the carrier. data with Mybackup. Now i’m enjoying some Gingerbread goodness. Is Gingerbread still allergic to Netflix? 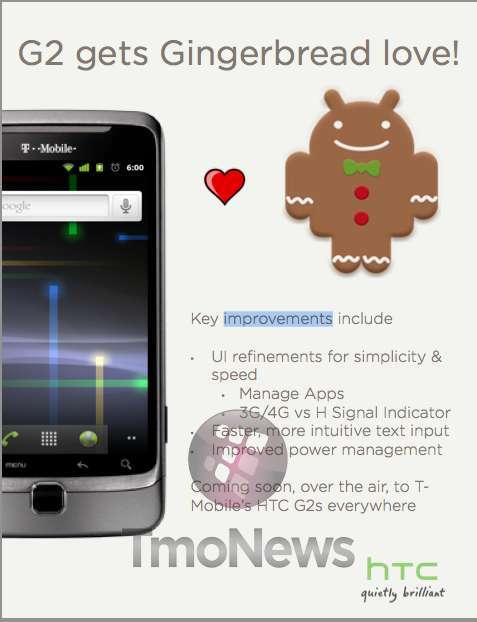 im waiting on android “ice-cream”.gingerbread outdated already on my device. Has anyone tested if Wifi Calling works properly? Those with WiFi bootloops need to pull the battery and then let it boot again. Old directory permissions problem long solved in CM7. Not sure what the draw is for those already running 2.3.FOUR in CM7 already, and has bug-fixes such as the camera button buzz. if i download this leaked version will i still be able to download the official update when it comes? its signed by tmobile so yes. I’d like to know this as well – if it botches the OTA official update, I’d rather just wait. Just upgraded and it went smoothly. FYI, this update did remove all of my apps. Performance seems noticeably improved. I also like the updated graphics. I am planning on getting a warranty exchange soon, because my keyboard comes and goes, and I am unrooted and on 2.2, if I get 2.3, will it break my warranty? or can I return it to tmobile without any problems? If you’re going to warranty replace it, why would you care about upgrading? I’ve had terrible luck with it. With juicedefender, I’m lucky to get ten hours on a full charge. I constantly drop signal, my reception is noticeably worse…..Mine was one of the first warranty replacements to ship with GB. My keyboard still comes and goes, my apps crash constantly….And I can’t root it to get rid of it. It’s been a long couple months with this phone, and it’s to the point i’m stuck between buying a new one and waiting for the at&t merger so i can go elsewhere. Check XDA on the G2/Desire Z forum. A root exploit was discovered a couple of days ago and the instructions have been published. I just came back and checked this. THANK YOU SO MUCH. Had it for about a month on my G2… Seems to use a little more battery, but otherwise it is great.. Just be sure to back up your apps because they will get wiped. work fine and is easy to install. I have been running it for about 2 months now. It looks like T-Mobile has yet again let me down there is no OTA update as of yet. I know the G2 is in the HTC list for getting Android 2.3. I wish that we had a system that was not control by cell companies and Cell phone makers. I would like to see a system that Google was in control with making a web site that would scan your phone hardware and detected if your phone can be upgraded or not. It would make things more easier for android phone users. Any way as far for T-Mobile give the G2 users their OTA release or give a release date. So what you’re saying is you want an iPhone. Now, that same build can be downloaded to your very own G2. Is it that not-so-open source that is causing manf. to release mobiles before 95% of the bugs are cleared, because they can’t wait any longer for the developers to figure it out, and hope to just deal with it later? I finally got tired of waiting and rooted my G2 last weekend and flashed MIUI. There is no valid reason that the update for this phone hasn’t happened months ago. Since I installed this leaked update my phone keeps launching car mode randomly. It doesn’t take me to the car mode screen, it just puts the icon in my notification bar. Also, whenever I make or receive a call the default is speaker. Any ideas? One last thing, will I be able to get the official OTA update still? Thanks. Jake, did you delete the PC10IMG.ZIP file from your SD card? keep trying to flash the update, but when the bootloader scans and detects the file, it comes up as “no image or wrong image” I’ve tried removing and reinstalling the file, but no luck. What am I doing wrong? I installed this a couple of days ago and I have no complaints. Boots up and runs much faster now. The vibration thing it does when you press the camera button is a little weird but I’ll get used to it. I’m glad I did it cus the OTA might never come. Such a shame…. The file says “corrupt or invalid” when I download it. When I go into the bootloader it doesn’t find the file, and when I choose recovery it gives me a red exclamation point. Hmph. If you got PC10IMG(1).zip or any other extension, the bootloader WILL NOT find the file. The file have to be also in the Root of the SDcard not on a folder. If you dont have that then you have a problem with your internet connection.